(Nehemiah 4:14) "Do not be afraid of them; remember the Lord who is great and awesome, and fight for your brothers, your sons, your daughters, your wives, and your houses." Basil Manly Jr. (1825-1892) once wrote a hymn to inspire the first graduates of The Southern Baptist Theological Seminary entitled "Soldiers of Christ, In Truth Arrayed." Such soldiers are called to embrace hardships and avoid entanglements so that we may please Him who enlisted us (2 Tim. 2:3-4). A few centuries ago, this article might have been entitled: “A Brief Sketch of Three Pernicious Struggles Within that System of Divine Truth Known as Evangelicalism Along With Modest Proposals for Their Amelioration.” Fancy. But, also obtuse. However, the persistent, and I would argue inherent, struggles within Evangelicalism are neither fancy nor obtuse. They’re messy and acute. Why does it seem that Evangelicals are constantly under siege and in danger of losing their minds, their confession, or their way in this world? In our “TL;DR” culture, allow me to summarize from the beginning. Because we Evangelicals are committed to living out our faith in a way that engages the world around us as ‘salt and light,’ we will constantly struggle with retreat (closing off from the world to protect ourselves), compromise (crossing the line and becoming conformed to the world), and shallowness (losing meaningful connection to the rich history of the Faith). We must recognize these struggles and intentionally work to equip our churches and members to face them with faithfulness. The origin of modern Evangelicalism finds itself in a missional imperative, that the church of Jesus Christ is called to be ‘salt and light’ in the culture (Matt. 5:13-16). Cultural engagement with the truth of Christ and the transformative power of the gospel on display in the lives and communities of believers is the heart of real, historic Evangelicalism. It is this commitment to both ‘hold fast’ and ‘hold forth’ the Truth, this commitment to both ‘be different’ and ‘make a difference,’ that gives rise to Evangelical distinction (cf. Phil. 2:15-16). Historically, our commitment to Biblical authority and truth distinguished us from many Mainline Christians who had begun redefining the faith in order to make Christianity compatible with the culture (often referenced as the Modernist Controversy). However, our commitment to cultural engagement is why the ‘new Evangelicals’ also grew in distinction from Fundamentalists, with whom they shared a common commitment to Biblical authority and doctrinal orthodoxy (see Carl F. Henry’s 1947 book The Uneasy Conscience of Modern Fundamentalism). Whereas Fundamentalism often tends to seek purity in isolation, Evangelicalism aims to maintain purity while engaging the culture around us. In order to stay the course and remain faithful in our calling to be ‘salt and light,’ we Evangelicals need to recognize the struggles that often accompany this commitment to cultural engagement. Our commitment to engage the prevailing culture around us is not without difficulty. We can quickly grow weary and long for a respite from the storm. However, that yearning for respite can easily grow into a temptation for retreat altogether. In time, some of us have eventually retreated back to our Christian enclaves, circled the wagons, and sought a more monastic relationship with the world. Whether it be the perceived safety of Fundamentalist disengagement or the flavor du jour, the so-called Benedict Option, sometimes we just grow tired of the fight and long for the safety of our own comfort zones. No doubt, churches were intended to provide such a safe haven. As a community of disciples we are to nurture and share life together as a covenanted community of the covenant people of God. We need safety, encouragement, spiritual nurture, and equipping to go back out into the world as ‘salt and light’. As every ship needs a safe harbor, likewise every believer needs a New Testament church fulfilling the ‘one-anothers’ and inculcating that ‘pattern of sound words’ that buoys us in the midst of ‘difficult times’ (cf. 2 Tim 1:13 & 3:1-17). But that respite within the church must not devolve into the church retreating from its missional imperative. We cannot rightly abandon the Great Commission or the Cultural Mandate as Christ’s body on earth. We cannot disengage from society, politics, or culture. We are here for a reason. Let’s be the Church. And as the Church, let’s be the ‘salt and light’ we were commissioned to be. We can mitigation the recurrent struggles of retreat and disengagement by providing the kind of sanctuary and community that are needed to facilitate our continued faithful engagement. We need to restore the authenticity and community of the local church as a safe harbor for believers, so that through spiritual nurture and maturing discipleship we can fully be equipped as ‘salt and light’. Rest in the Lord and respite in his Church helps us reform the lines as we march forward, engaging the culture with the truth of the Gospel, remembering the promise of Christ Himself who said, "I will build my church, and the gates of hell shall not prevail against it" (Matt. 16:18). Whereas some run away from the culture in retreat, others rush towards it with a recklessness that results in a surrender of compromise. There is a native struggle within our engagement model that constantly threatens us with compromise. If we completely withdrew from society as the Amish did generations ago, we would not face this struggle in the same way that we do. However, as addressed above, isolation isn’t the answer. Engagement requires some level of participation. But, participation in culture without Biblical separation (cf. 2 Cor. 6:17) eventually results in compromise. Stuart Hall in his Doctrine and Practice in the Early Church commented, “The society in which the Church spread affected it greatly.” But this is almost always true. Church history shows us that churches of every era often reflect their surrounding contexts. Like a prism refracting the spectrum of light surrounding it, we can see some of the cultural conditions that surrounded the churches. But when does this become compromise? No doubt, accommodation and contextualization of ministry is different from compromise. However, the lines can easily become blurred. We like to say our message is unchanging while our methods may change with the times. However, if we assess ourselves soberly, we see our mentality and morality also tend to change with the times as well, often for the worse. Where this occurs, the surrender of the message is sure to follow. This is evidence of corrupting compromise with the culture and a failure to truly be the ‘salt and light’. Adrian Rogers used to ask his congregation what would happen if you put a glove in the mud. Would the mud become “glovey” or would the glove become muddy? How do we engage a muddy culture and reach out a hand to muddy sinners without becoming muddied ourselves? It’s easier to either jump in the mud or else run far away from it. How do we remain a ‘friend of sinners’ (Matt. 11:19) without becoming a ‘friend of the world’ (James 4:4)? How do we participate in society without capitulating to its thinking or values? This is the challenge we face both personally and corporately as Evangelicals. Compromise leads to corruption, and corruption can occur both through neglecting that which is good and right as well as importing that which isn’t. The only way to know the difference between contextualization and compromise is to carefully build and regulate our lives based on God’s Word. The key to not being ‘conformed to this world’ is to be transformed by the renewing of our minds in God’s truth (Rom. 12.2). This is one reason why our commitment to Biblical authority and sufficiency is so important. Many are not aware that the rise of theological liberalism in the early 20th Century was actually motivated by a desire to ‘salvage’ Christianity and make it palatable to the culture of modernity. Jettisoning the ‘myths’ and miracles, they hoped modern man would still want Jesus. But by becoming untethered to Biblical authority, Liberalism lost its mooring and drifted out to sea. Christianity was lost rather than rescued. Evangelicalism periodically sees a repeat of this same compromising pattern. Many of us are concerned that the “emergent movement” is simply another expression of apostasy, as always, designed to “salvage” Christianity and make it palatable to the culture, this time to post-modernity. We are also seeing similar trajectories by those who attempt to reconcile Christianity with a culture that embraces gender confusion, homosexual practice, and same-gender marriage. They want the Church and Christianity to remain relevant, but at what cost? The medicine of the Scriptures is an inoculation against the disease of cultural compromise. We must remain firmly rooted in the unchanging truths and timeless principles revealed in God’s Word or else we’ll simply drift with the culture, “tossed here and there by waves and carried about by every wind of doctrine” (Eph. 4:14). One generation of Evangelicals contended earnestly for the authority of Scripture. Another contended for the sufficiency of Scripture. We cannot stop there, however. We must now also earnestly contend for the ‘literacy of Scripture’ among our people. Our churches and pastors must help dispel the Biblical illiteracy that plagues many of our members. Many neither know the Scriptures nor how to apply them in faithful Christian living. Evangelicals must be properly equipped in the Word of Truth or else cultural engagement quickly becomes cultural compromise. We must do a better job of discipling the disciples, helping them to think and live Christianly and Biblically. The Early Church faced many of the same cultural challenges we are increasingly facing today. As the spread of the Gospel progressively reached those who were unacquainted with the Scriptures and outside of the synagogues, the churches had to exercise great care in catechizing (instructing) converts. Many catechumens spent two to three years of intensive moral and doctrinal training before being baptized and allowed to experience the full complement of church membership (such as the Lord’s Table etc.). Before a believer publicly signified their commitment to the Kingdom of Christ in baptism, it was important for them to understand the commitment and testimony they were making, lest compromise lead to shipwreck or scandal (cf. 1 Tim. 1:19). I’m not suggesting we delay baptism or church membership as they once did. However, we must provide similar comprehensive discipleship. We cannot assume a common background or neglect such instruction or else our churches will increasingly reflect the culture rather than Christ. We will lose our saltiness and illumination. We will surrender and be assimilated by the culture we were tasked to reach. One common casualty of the constantly changing landscape of Evangelicalism is our sense of depth and substance. Evangelical churches change and breathe along with the culture over time as we attempt to reach our culture for Christ. We try to do so without compromise, either theologically or morally, but many other aspects of how we reflect and exercise our faith do and will change. This constant change can result in a shallowness that has been felt by many Evangelicals over the years. The shiny and new ironically gets old fast. Dissatisfaction with either our experiential satisfaction or perceived effectiveness often leads to paradigm shifts, new models, and new practices. Every few years we push new books that reinvent ministry and polity, promising a panacea to our problems. A couple generations ago, it was about implementing the right programs coming down the pike. A generation ago it was the contention that if we just unplugged the organs and plugged in the guitar amps, our worship and evangelistic success would be renewed. In order to take hold of something new, we inevitably must discard other things. But how do we rightly evaluate what is lost and what is embraced? Many of us, at various times and in various ways, have sought to increase our depth and our connection with the historic continuity of the Christian Church by rediscovering spiritual practice and thought from the past. Whether it’s the Patristics (early church fathers), Medieval monks or mystics, the Reformers, or other liturgical traditions, we see a groping within Evangelicalism for depth and substance. This reconnection with our Christian history is important. Spiritual and ecclesial amnesia, forgetting who we are in Christ and in the progressive unfolding of God’s redemptive providence, makes us vulnerable to losing our distinctive Christian identity out in the culture. However, there is also danger here. Sometimes such alien appropriation of tradition and practice can result in unintended incongruence. We may advocate things we do not fully understand and have failed to vet fully by the Word of God. Please understand that Evangelicalism need not be shallow. The culture and practice of our churches, while breathing along with the wider culture, do not have to be as disposable and transitory as the fads, styles, and goods of our day. We can maintain Biblical substance, conviction, tradition, and depth of spirituality while engaging the world around us in meaningful and relevant ways. The real question is, how? This struggle with shallowness is very much tied to our concurrent struggles with retreat and compromise, and the answers or solutions are largely the same. We must remain tethered to Biblical authority in faith, practice, and life. The tenet of Ecclesia semper reformanda (the church always reforming) is helpful here, as long as we are reforming by and back to the Scriptural witness, rather than reforming ourselves to simply fit with the culture or some previous era. This involves not only a robust exegesis of Scripture, but also historical and cultural reflection. There needs to be an intense Biblical scrutiny of what changes we are making, what traditions we are retaining, and what practices we are importing. Old or new, ancient or modern, all things must be examined carefully, so that that we can “hold fast to that which is good” (1 Thess. 5:21). These and other struggles are the nature of our calling. Our model and mission demand it. We “earnestly contend for the faith which was once delivered unto the saints” (Jude 1:3). Giving up the fight in either cultural surrender & compromise or disengagement & retreat is to abandon our post and cease to be ‘salt and light’. We are often talking about how Evangelicalism is at a crossroads, but this is precisely the point. We have always been at the crossroads, the intersection of the Kingdom of Christ and a world of lost sinners, where Christ confronts culture with His radical message of redemption and transformation. Stand post, Evangelicals. Neither retreat nor surrender, for we know we are fighting a battle that has already been won: "These things I have spoken to you, so that in Me you may have peace. In the world you have tribulation, but take courage; I have overcome the world" (John 16:33). 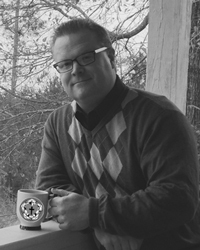 Klay A. Aspinwall (BA, Union University; MDiv, The Southern Baptist Theological Seminary) is a Southern Baptist pastor who has served churches in Tennessee, Florida, and Georgia. W. Bruce Ostrom (BA, College of Charleston; MDiv & PhD, The Southern Baptist Theological Seminary) is a Southern Baptist pastor who has served churches in Kentucky, Indiana, and South Carolina. He is also an Adjunct Professor of Theology at Anderson University.